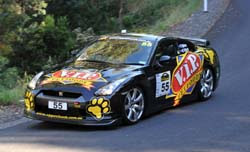 Tony Quinn in the VIP Petfoods Nissan GT-R and Jim Richards in the 911 GT2 were battling back and forth at the Rally Tasmania yesterday, today Tony managed to strech the gap to a 14.4 second margin winning the event. Tony Alford in the Donut King GT-R finished in 5th place. “It’s great to win a fantastic event,” Quinn said. “We had to push really hard today to keep Jim (Richards) at bay, but we managed to bring it home.